Countries like Finland, Russia, Thailand, Korea, and Japan have always practiced the tradition of taking cold showers for good health. Researchers have also identified many health benefits of exposing the body to regular bursts of cold water. Read on to find out why you should start feeling the chill of cold showers! Researchers in the past have shown that individuals who took cold showers everyday showed an increased number of white blood cells, and could fight infections better than individuals who took hot showers. Researchers believed that the increased metabolic rate, which resulted from the body's attempt to keep itself warm, activated the immune system and released more white blood cells in response and this helped to fight infections. Good blood circulation is very important for overall cardiovascular health. It also speeds up your recovery after a strenuous exercise or work. Alternating between hot and cold showers is an easy way of improving your blood circulation. When you take a cold shower, the cold water causes your blood to flow to your organs to keep them warm, whereas warm water reverses the effect and causes the blood to move towards the surface of the skin, thus improving your circulation and preventing problems such as hypertension, atherosclerosis, and varicose veins. Brown fat is heavily involved in burning energy. Taking cold showers naturally stimulate the production of these brown fats. Higher amount of brown fat burns more calories per second and increases the person's metabolism, thus promoting weight loss. Cold showers stimulate noradrenaline secretion in the brain and this prevents depression. Hot water tends to dry the skin and hair. If you want to avoid irritating itchy skin and want your hair to look shinier, turn down the temperature of your water. Cold water prevents drying of the hair and makes your skin look healthier by closing up the cuticles and pores. Cold water leads to thermogenesis (i.e. internal generation of body heat). So, if you suffer from chronically cold hands and feet, or sweat abnormally start taking a cold shower. 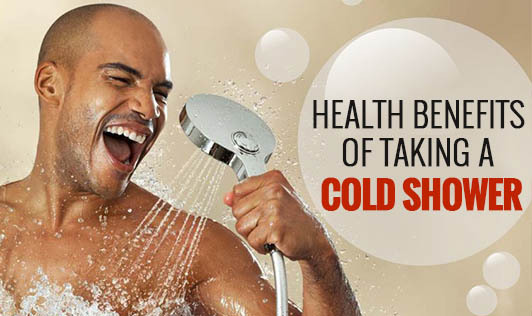 Cold showers makes you inhale deeply to combat the cold shock and keep yourself warm. This process of inhaling helps you open up the lungs, just like exercise, and increases your intake of oxygen, thereby preventing you from feeling tired. It also helps you perform better in sports and other exercises. Trying for a baby? Take a cold shower. Cold showers are good for your sperms. Sperm count decreases when the temperature of the testes increases. According to a study done in the 1950's, men who took a 30-minute hot shower daily for 3 weeks were infertile for the next 6 months. More recent study done in San Franciso showed that when men who were exposed to 30 minutes of hot water were cut off from the heat exposure, their sperm count went up by 91% and their sperm motility improved drastically. So, if you're trying for a baby, a cold shower would definitely help.